What’s Your Style of Camping? There are small, family run campgrounds and larger facilities too. Most have full hookups as well as tent sites. Some campgrounds have cabins and camping cabins. You can even stay in a yurt! And please don’t bring your own firewood. Here’s why. 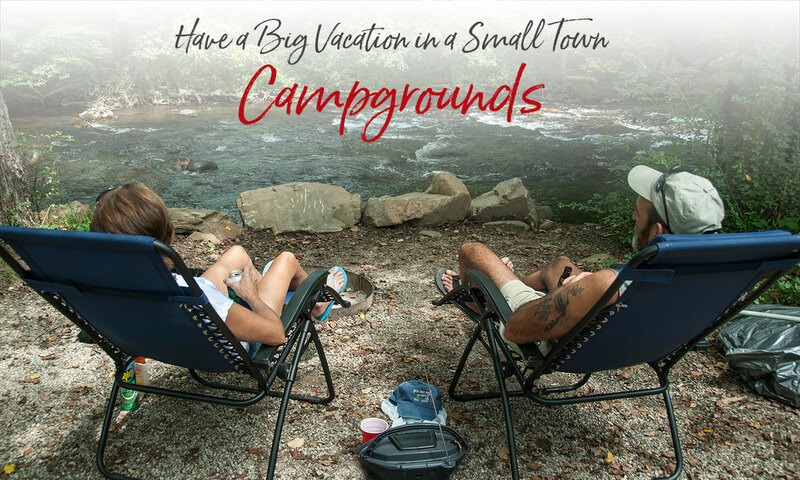 Find a Bryson City campground for your next getaway. Search by name and by amenities. Click on thumbnails to enlarge. Come relax in the mountains at the Hideaway Campground. Centrally located on US Hwy 19 between Bryson City and Cherokee with 18 full hookups. We also have remote tenting, hot showers, laundry room and a pool. Wireless Internet access. Lodge can sleep group of 35. Resort camping on the river. Two swimming pool, two 25 person hot tub, fantastic trout fishing, free shopping and casino shuttle to Cherokee, movies, tubing, horseback riding, weekend entertainment. 400 sites, 35 deluxe camping cabins!. Open all year! Located east of Bryson City. 150 acres, spacious campsites. Fishing, swimming, boating, hiking trail, clean restrooms, hot showers, laundry, electricity, water, disposal station. Mobile home for rent by the week. Open May through October. Two ponds on the property for swimming, floats available! Gorgeous Stays offers a unique selection of differently themed and decorated tiny homes, vacation rentals, glamping tents and campsites located in the scenic Nantahala Gorge. Envisioned by a creative mother and daughter team, Gorgeous Stays has everything you need for an unforgettable stay in the Great Smokies! Located on Hwy. 28N, 2 miles from Junction 19&74. Large campsites, 20 amp power service. Raised tent pads. Internet access facilities. Open March through November. Enjoy a peaceful time camping by a small flowing creek with a beautiful mountain backdrop. Located in the Nantahala Gorge, you are only minutes away from whitewater rafting and zip lining, as well as boating and fishing on Fontana Lake, and world class mountain biking at the Tsali Recreation Area. Address: 832 Deep Creek Rd. Located on Deep Creek, Big Bear's RV Park features creek-side sites in a quiet, relaxing, family friendly location! Large spacious sites, big rig accessible, and easy access with pull thru sites available. Full hook-ups (water, sewer, 30/50 Amp Electric, Wifi). Conveniently located approximately 1 mile from downtown Bryson City and the Great Smoky Mountains National Park. Open year round. Conveniently located only 1/4 of a mile from the Swain County Event Center and on the bank of the Tuckaseegee River, our quiet campground offers 55 large RV sites each with a riverside deck, fire ring and picnic table, tent sites, large, clean bathhouse, and easy access to either Bryson City or Cherokee via US 19 or Hwy 74 West. 50 campsites nestled in the Deep Creek valley with view of the mountains and the soothing sounds of Deep Creek. Full hook-ups, 30 or 50 amp and primitive sites. 1 mile from the GSMNP. Tubing, camp store, trout fishing, volleyball, laundry, playground, and 2 clean bathhouses on site. Open April-November. Campground on Deep Creek. Full hookup, hot showers, 1 cabin with air conditioning. 10-15 camper or tent spaces. Looking for a great place to go camping in the Smoky Mountains? Whether you are traveling with a tent or motorhome, you'll love the quiet, shady Ela Campground on the Tuckaseigee River midway between Bryson City and Cherokee. Address: 1612 Panther Creek Rd. Located on Panther Creek, 1-1/2 miles off NC 28, between Bryson City and Fontana Dam. Open March 1st to December 1st. All sites have full hookups for electric, water and sewer. Hot showers and clean restrooms available for all campers. Volleyball court, horseshoe pit, pavilion with full kitchen and coin laundry. Outdoor Trout farm. Free pole, bait and cleaning! Trout $3.00 per pound. Bryson City's newest campground and RV park located on the banks of the Tuckasegee River. Featuring 20 full hook up sites, 10 spacious tent sites, and "the best bath house in the state". Enjoy an inviting escape and soak up the outdoors with our fully powered bell tents. Located just beside the entrance to The Great Smoky Mountains National Park in the Deep Creek community, our campsite offers fully furnished 16 x 16 bell tents with plug ins available for all of your electronic needs. Bath house on site with separate men's and women's facilities, snack shop, and fire pits are located at each tent site. Located in Cherokee, North Carolina, our family-friendly facilities include 130 sites on ten acres in the Great Smoky Mountains. Convenient to U.S. 441, but far off the beaten path, you'll find quiet and solitude, with plenty of facilities and amenities to make your Great Smokies vacation a memorable one! Convenient and close to many activities and attractions including the Great Smoky Mountains National Park, trophy fishing, the Great Smoky Mountains Railroad, shopping and dining, Harrah's Cherokee Casino, and more. Located 12.7 miles west of Bryson City. Tents, pop-ups, small trailers (under 21 feet). All wooded campsites along creek, water and electricity on some sites. Open April through October. Even though our Western North Carolina campgrounds are “away from it all,” you’ll find yourself close to all the things there are to do in the Smoky Mountains. Go for a hike, ride the Great Smoky Mountains Railroad, go whitewater rafting, horseback riding or mountain biking. But if you just want to hang out at the campground, you’re likely to find swimming pools, campfires, volleyball, tubing, even trout fishing. 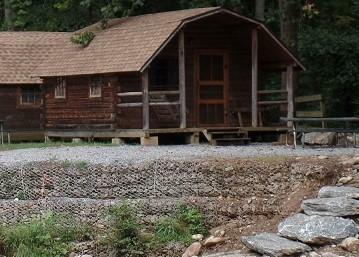 Some Bryson City campgrounds are open year-round, some seasonally. And if you want to bring along the family pet, there’s a Bryson City pet-friendly campground that you both will love.